The Nurse is a creepy and deadly misrepresentation of the town’s fears and anxiety. It doesn’t help that Silent Hill already has two scary hospitals. Once inside, you will be surrounded by hordes of Nurses that will attack you with different kinds of weapons. Best be careful. The Nurse looks like a twisted version of the medical worker. She wears a yellowing, bloodied nurse dress, a nurse’s cap, yellowing white heels, and bloody bandages wrapped around her head. She’s one attendant that you’d rather not meet. 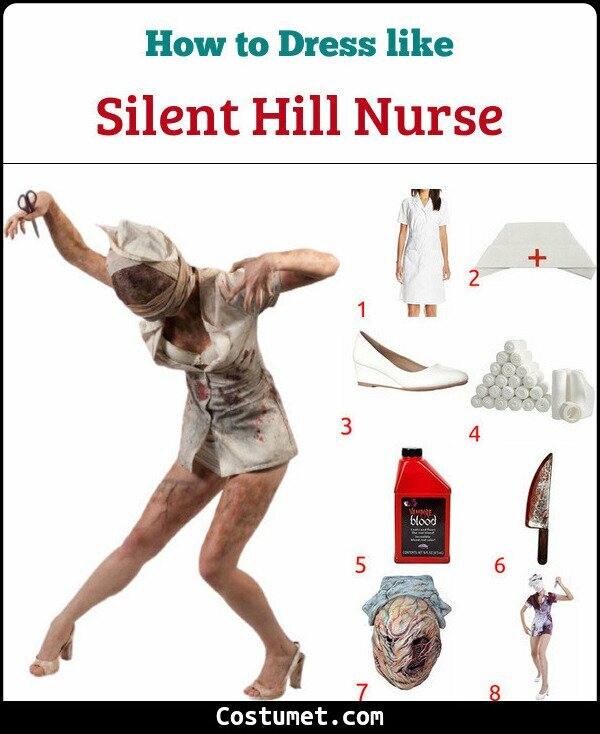 Here’s everything you need to look like the Nurse from Silent Hill. 1 White Nurse Dress Uniform This pristine white nurse dress is the perfect base for your Nurse costume. Just make sure to dirty it up. You can soak it in coffee to give it that aged yellowing effect. 2 Nurse’s Hat Show your rank and add a touch of creepy normality with a nurse’s hat perched atop your head. 3 White Closed Toe Sandals The Nurse is deadly but she still has a sense of fashion by wearing a pair of white closed toe sandals. 4 White Gauze Bandage Rolls Wrap multiple layers of gauze bandage rolls to mimic the Nurse’s look. Don’t make it look neat. Keep it as disheveled as possible. 5 Fake Blood To level up your goriness, put on some fake blood on your dress, skin, and gauze. 6 Bloody Knife The Nurse carries different weapons throughout her stint in the series. One of those weapons is a bloody knife so bring one along. 7 Nurse Mask If you don’t have the time to make your own props, you can get this pre-made Nurse mask. 8 Full Costume Full costume if you want to save some time. The Nurse is a recurring monster in the video game and can be seen in all 15 titles and in the film version as well. Unlike the other monsters in the series, the Nurse is usually integrated more into the story, making it an important minor character. Regan Macneil nightgown becomes torn and covered in green slime that she vomits; the turn in Regan symbolizes a huge loss of innocence. Pyramid Head has the body of a male man who has a long, bloodied, dirty white fabric wrapped around his torso and a very long and deadly-looking Great Knife.